If you wish to have a vegetarian and vegan friendly meal that can extend to lunch or dinner for more than one day, this is the loose recipe for you! The following is a loose recipe that is malleable enough to tweak to your desire while still staying true to the intended essence. When looking at how this loose recipe comes together think of yourself and your tastes, this is merely a guideline for you to play with in the kitchen! It’s an extended curry that is coupled with a coconut basmati rice. Adding veggies like kale and sweet potatoes will stretch the pot! 🌶Whenever I’ve bought lentils in the past, I’ve purchased a 1 lb bag and used that full bag for a whole pot. For one person, it lasts about two weeks depending on how often you eat it in the following days. Buying in bulk may help save you money! 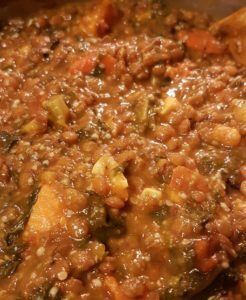 There is no set amount for anything, if you want to use half a pound of lentils with two sweet potatoes and no coriander, go ahead! 🌶Wash all produce. Cut sweet potatoes and russet potatoes into small or medium sized pieces. The kale can be cut beforehand, or you can also simply tear pieces off throughout cooking to add to the pot as you go. 🌶Bring some clean water to a boil in a large pot. (Water to lentil ratios will be on bag or bulk tag.) Throughout the cooking you will continue to add water as you go along to keep the consistency loose and to prevent the curry from burning, and if you desire to cook it longer to split the lentils more. Once the water has some bubbles and is at a light boil, throw the lentils into the pot. The curry will cook best on a medium to medium high heat. 🌶Add spices listed above to the pot as you notice the water level in the pot decreasing and the lentils become more like a soup. Add as you see fit, always safe to start light–it is easier to add than to take away! If using an Indian Simmer Sauce add later at about 20 or 30 mins in with the coconut milk or cream. 🌶About 20 to 30 mins in, the pot of lentils will have thickened some, at this point you should add some coconut milk or cream to soften the boil. Stir the coconut milk or cream in and allow the pot to warm for about 5 mins. After this add the cut sweet potatoes and russet potatoes. For the potatoes to reach a desired softness the curry will have to cook at least 25 mins on a medium heat; the potatoes can be softened prior by heating them in the microwave up to 4 mins to speed up the process in the pot if you’d like. The last thing that is to be added is the kale, cook for as long as you feel is best for crunch. This is everything! 🌶Cook as suggested on the bag or on bulk tag. Bring (coconut) water to a boil, add coconut oil. Once water is at a medium boil add rice and salt, make sure there is still about an inch of water. Once rice starts to soften add some coconut milk or cream slowly, turn down heat and continue to cook adding more coconut milk or cream as you see fit. Feel free to garnish with any leftover basil, add carrots, cherry tomatoes–make this dish your own! Enjoy!